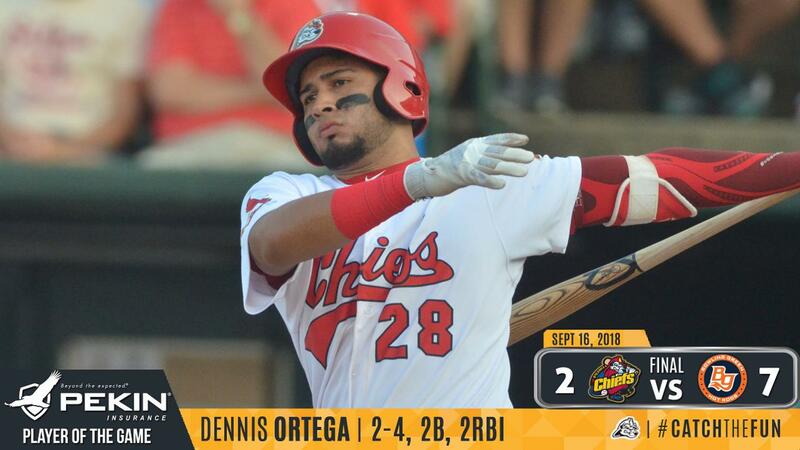 Bowling Green, KY - The Peoria Chiefs season came to an end with a 7-2 loss in game four of the Midwest League Championship Series Sunday night as the Bowling Green Hot Rods claimed the title. The loss marks the third time in four appearances the Chiefs have lost in the MWL finals and the first since 1986. Bowling Green jumped out to an early lead in the bottom of the first against Angel Rondon. Vidal Brujan walked to start the inning and he scored on a double to center by Moises Gomez as the Hot Rods went on top 1-0. The Chiefs committed two errors in the bottom of the second and Bowling Green plated five runs that were all unearned. Trevor Walls had the big hit with another double after Brujan singled home a run. CJ Saylor took over on the mound for Rondon with the Hot Rods up 5-0 and Jim Haley singled home Walls for a 6-0 lead. A home run by Trey Hair led off the bottom of the third for Bowling Green and put the Chiefs down 7-0. The Chiefs got on the board against Paul Campbell in the sixth. Yariel Gonzalez picked up his second hit of the game and 11th of the playoffs with a one-out single. Luken Baker drew a walk and with two outs Dennis Ortega doubled off the wall in left to cut the BG lead to 7-2. Rondon (0-1) took the loss as he allowed six runs, one earned, on five hits and a walk over 1 2/3 innings while striking out one. Saylor allowed one run on two hits over 3 1/3 innings while striking out two. Ben Yokley struck out five and allowed just one hit over three shutout innings.